This document allows you to grant a licence to someone else to hold an event, show, exhibition or fair on your land for a short and specific period of time. The range of events that could be held is large, from a local show, to an equestrian competition to a market or car boot sale, to having a wedding marquee on the land. Since the land is likely to be of high value, the document contains provisions that ensure the occupier looks after it. 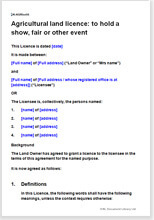 Use this licence to allow a third party to hold an event on your land. The event should take place for a short period of time, such as over three days in June, or every third Saturday in the month between March and September. The agreement allows additional time for setting out, packing up and cleaning. Land law that applies to agricultural tenancies.. The law in this document is common law, giving you greater flexibility to decide your own terms with your licensee. Important to the licence remaining as such, and not becoming a lease (giving more rights to the tenant) is that the landlord retains access to the land at all times and remains in control of and responsible for services (such as electricity and water) and larger maintenance works. Other permissions to hold the event may be likely, for purposes such as serving alcohol or using the land in a particular way (local councils tend to control who may and may not run certain events, even if the event takes place on private land). This document does not remove the need for the event organiser to obtain all other relevant permissions from other sources to hold the event. This licence grants permission to occupy land for a specific purpose for a specific, limited amount of time. If the occupation is continual and for more than a short period (say 3 months), then using a lease might be more suitable.However, if the event is recurring but for a short period (such as a car boot sale every Sunday for four months) then this licence should be used. This licence is suitable for a large number of different uses for the land, from shows, to car parking for an event nearby. The licensee could be an individual or a business.